Greg: Good to see you, Jason. Jason: Thank you, Greg. It’s always good to have you back. Greg: That is very nice. I have a quick little story for you. I’m hoping you can help me out going forward. Last night, I was in the kitchen doing a little cooking and I pulled out one of my kitchen cabinet drawers and literally pulled it out. It fell on the floor with everything in it, and it gets my wife and I thinking in the future we need a new kitchen, and then eventually when we get a new house, we’d like to build one day, building a new kitchen from scratch. That’s got to be sort of a fun blank slate to start with. I haven’t started a new kitchen in 15-20 years. What has changed? What do I need to look for? Jason: There’s lots of new technologies and new things, but it really boils down to still a good, functional design, to have a lot of functional work space and a couple of different prep spaces that is going to make the chef in the family the envy of his friends. Greg: Since you’re building custom homes and new homes, do you try to get an idea of what kind of cooking or what level of cooking your clients are looking for? Or do you go with what you like as a kitchen and then hope that they can fit their lifestyle into that kitchen? Jason: No, it’s part of our process. When we start designing a home, we’ll talk to the client and find out, “Do you like to cook? Do you not like to cook?” Believe it or not, a lot of folks in the high-end homes we’re building do not like to cook. They have busy lifestyles and they eat out all the time, but they still want a functional kitchen. Then you have the other folks who are really into cooking and really like to have all the bells and whistles that are required in a new kitchen to make life easier for them. Greg: It needs to be functional but also serve sort of as a showpiece, a show kitchen? Jason: Yeah. It has to be a showpiece but then functional. One of the things that I like to do and recommend when we’re designing a kitchen is I like to hide a lot of the appliances or blend them into the cabinetry as best as we can. One of the things I like to incorporate in a lot of my kitchens are just simply like appliance garages. When people come through the kitchen, you don’t want to see a toaster sitting on the countertop or a microwave, but those appliances are used every day, so they have to be very, very easily accessible and at that right level. An appliance garage is one way to do it. We can do a lift-up or a fold-out. Jason: You basically would lift up, you’d pull up and then slide the cabinet back above the toaster so you’ve got the toaster right there. The toaster always stays plugged in. You don’t have to pull it out of the cabinet. It’s just right there. You have it, put your toast in. When you’re done, you push it back into the appliance garage and close the door. You can also have a little divider to have your bread there as well, so you’ve got it all right there. Greg: Okay. Very cool. Try to keep appliances out of the way. What about the big stuff, the stove and the refrigerator? Obviously, you’re not going to hide that stuff, but are there some trends that are a little bit more prevalent now than they were …? Jason: Yeah. One of the biggest factors when you start the design is do you want a slide-in range, which would be either like a … You work from a 30-inch to a 48-inch slide-in range that would have your gas cooktop on the top and then you’d either have a single or double or even a triple oven down below. Greg: I’m just curious now, triple oven, I’m trying to visualize. That would have to be on a wider range and two stack and one to the side? Jason: Yeah. You’d have a 48-inch, minimum probably a 48-inch slide-in range. You’d have a single larger oven on one side. Then you could actually have two smaller ovens on the opposite side. Greg: To get back to your earlier comment, is an oven like that … I would love one, but is that more if someone’s really into cooking? Is that a good indicator? Jason: … you’re going to invest a significant sum in a slide-in range, so if you go with a nice 48-inch range, you could be upwards of $10,000. Jason: For just that, which a lot of people building a new home, their budget may be less than that for their appliances. Greg: Set up for that. Greg: How comfortable are you in a kitchen to help someone through that kind of process or do you bring someone in to talk to … ? Jason: I’m comfortable. I love to cook. As part of designing and building luxury homes, I like to assemble a great team. I always like to have an experienced kitchen designer as well as an interior designer working with my customer to make sure it’s functional and has the form to give them what they’re after. Jason: Yeah. There are two options basically. You can have a slide-in professional style range or a lot of people will still opt for a cooktop and then off to the side will have double ovens. It’s not as pretty to look at, but it’s probably a little bit more functional because you can have double ovens that are kind of at eye level. People like those. It’s maybe a little bit easier to get stuff in and out of the oven. The downside to the professional larger range is you do have to bend over just a little bit to get the turkey or casseroles in there. Jason: Yeah, no, that’s absolutely correct. We’ll steer them. After typically a couple quick questions, we’ll understand pretty quickly what direction we’ll gear or head the client towards. Greg: Right. Then a refrigerator, does that sort of fall … ? You figure out what kind of kitchen you want and the refrigerator is going to fill itself in, like this kind of goes with that kind of stove? You don’t want a really little rinky-dink refrigerator if you’ve got the 48-inch massive cooktop. Jason: Again, with refrigeration, there’s a couple of options, as there was with the stove. Everybody always wants a built-in fridge, side by side, that may be anywhere from 48-60 inches wide. Again, that comes with a hefty cost. Jason: Most people are realistic. Sometimes they don’t understand how much it does cost for the built-in refrigeration. Again, you could be upwards of $10,000. Greg: For that piece alone? Jason: For one piece of built-in refrigeration. Jason: What we’re seeing a lot of times nowadays is our clients are going with a nice French door, side-by-side refrigerator, very modest cost, so they have one refrigerator. Then we’re doing a lot of larger, walk-in pantries to where we’ll do a secondary fridge-freezer combination that is still part of the kitchen, yet it’s a little bit away. It’s not going to be seen by the public very often, so you can get a much less expensive model, tuck it in the pantry, and store all that leftover stuff from the big Costco run. Greg: Okay. Juice boxes for the kids or maybe some beer for whoever, that kind of stuff that’s just sort of in bulk. Jason: Yeah, a lot of bulk meats and any of that stuff. We try to recommend that the client look at doing a under-counter fridge, maybe in the island or next to the sink or something for the juice boxes, beer, wine that’s very easily accessible. Then you could have the overflow in the pantry fridge. Greg: When planning a kitchen, what is your view on an island? Is that something that you feel strongly about one way or another or, again, is that discussed between you and the client and you figure out this kitchen needs an island or every kitchen needs an island or I hate islands? How does that work? Greg: Is this your view or this is sort of national, that in 2015 islands are … ? Jason: In the past, there’s been 2-tiered islands, multi-levels and all that. Now the trend lately has been 1 level island that’s at counter height, not bar stool height, so it can serve as a large work station if you’re rolling out cookies or baking, any of that stuff. You’ve got a nice, flat surface that’s easily accessible from all 4 sides. It makes it nice. If you have a larger family or you’ve got a smaller family, you can have 3, 4, 5, 6 people all gathered around the island, all engaged in 1 activity. Greg: Okay, that sounds awesome. What have I missed here? How about cabinets? Greg: This is going to be a pricey one, right? You’ve already said a couple of pricey ticket items, but cabinets. Jason: The cabinets, it’s understood that’s probably going to be the biggest ticket item in the kitchen. The trend nowadays is very white, very clean, no glaze. We’ve really gotten away from the glazed cabinets. A lot of people really like the look of the inset cabinet where the doors are flush to the frames. That comes with about a 25-30% up-charge. People see it in the magazines, they’re always attracted to it. Greg: Because it looks great. Jason: Give them a reality check and say, hey, that’s going to be a little bit more. Some people opt to go that way. Most people are still going to a standard overlay or a full overlay cabinet in white. Sometimes they’re a little bit more Shaker style as opposed to a raised panel design, so, again, very clean line. We’ve always been a fan of taking our kitchen cabinets all the way up to the ceiling, adding some decorative lighted cabinets up there. It just fills the space. It doesn’t leave a spot for all those dust bunnies to collect. Greg: Right. In the price range that you build in, typically when someone says custom home building, does that mean when you do kitchen cabinets that the cabinets themselves are going to be hand-crafted by an artist somewhere or are these cabinets often picked up at a hardware store? Where are the cabinets coming from? Greg: A filler strip, that means that if my wall is … I’m going to make up a measurement, I don’t know, 40 inches and Lowe’s has this cabinet that’s 36 inches, they have to figure out a way to make that extra 4 inches look like cabinet but it’s not actually …? Jason: That’s right. They’ll just put a flat 4-inch piece of wood there where it connects to the wall. Jason: Whereas in a custom kitchen, we’re going to go all the way to the wall and fill that space. It’s a nicer, higher-end look and usually the quality is a little bit better with the custom cabinetry. Greg: Okay. When you’re working with a client and you want to build this kitchen that looks fabulous, your name is going to be on it, someone’s going to see it in 10 years, how much do you try to look forward to this kitchen will be beautiful for as long as the owner wants to maintain it versus this is hot and in 6 months, I’m going to totally switch directions and these guys, they have a dated kitchen? How do you work that? 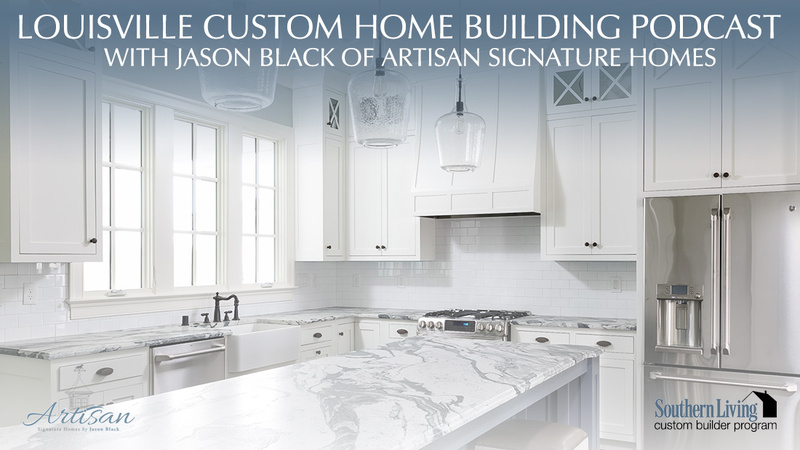 Jason: I’ve been building homes now for over a dozen years, and I can look at kitchens I’ve done over 10 years ago and I think they still look very current. We try not to get too trendy, but we try to be current, so you’re walking a fine line. With traditional cabinetry, white cabinets, very clean, it’s going to be in style. There may be certain things that come and go over time, but a good kitchen will usually stand the test of time. Greg: Pretty much if it’s done well, that’ll shine through and will always have been done well so it looks good 10 years down the road? Jason: Yeah. The design, obviously, is very important, the functionality, the layout. All those factors are not going to change the way somebody’s going to cook. Somebody may come in in 10 years and want to update the range or something like that, but for the most part, everything should be intact. Greg: Okay. I think we’re coming up on the end of the time that we have here, but I wanted to ask you, when a client comes to you, what is maybe the most important thing they can have ready or the most important aspect of a kitchen? When you’re looking to put together this beautiful custom home and you’re thinking about the kitchen, what’s the number-one thing that we all need to keep in mind? Jason: I think, again, we talk a lot about functionality, but we want to have a good design. One thing we didn’t touch on is I always like my kitchens to be connected to the outdoors, whether it’s a sink over the window or it’s a door out to the patio, so easy access to the grill. The layout, functionality, and accessibility to the outside is one of the things that sometimes people don’t think about, but I think is very important. Greg: That is wonderful. I’m looking forward to going out and seeing some of your new homes and new kitchens. Jason: Yeah, come check us out. We’ve got a lot of great new products out there. Greg: That sounds great. I’ll talk to you next week.